BREAKING ICE in Kingston Marina last week so MetalCraft Marine could conduct late-season vessel sea-trials in open water. UNDERWATER ADVENTURE IN KINGSTON is a short and very cool promotional video about wreck diving in Kingston. Produced by Travel Canada. THE DECEMBER 2009 Thousand Islands Life is now available. DOCK UPGRADES AT CONFED are expected by springtime. 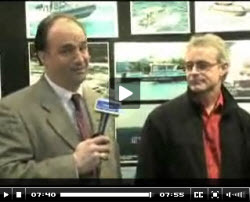 INTERESTING INTERVIEW with MetalCraft Marine Contracts Manager Bob Clark from the tradeshow floor of the 2009 International WorkBoat Convention in New Orleans, LA. In the interview Bob talks about the history of MetalCraft Marine, and the boats they design and build. Most people in Kingston don't realize the degree to which MetalCraft Marine is a player in the high-end fireboat and patrol boat markets. HATTERS BAY PARK is still in jeopardy according to the Portmouth Villagers Association. You may recall that the Coast Guard wants to shift their base from the west-side to the east-side of POH, clobbering the park, or access to the park, in the process. Read more on the issue. SAILBOAT RIDE IN KINGSTON for the Olympic Torch relay on December 15th. The torchbearer is Olympian and CORK chairman Tim Irwin.